My wife and I recently returned to Barbados after our trip to Panama City, Republic of Panama,Central America – from April 13th – 16th 2009) for the 3rd Indigenous Leaders Summit of the Americas; while there I was pleasantly surprised to meet two middle-aged men of Barbadian parentage. 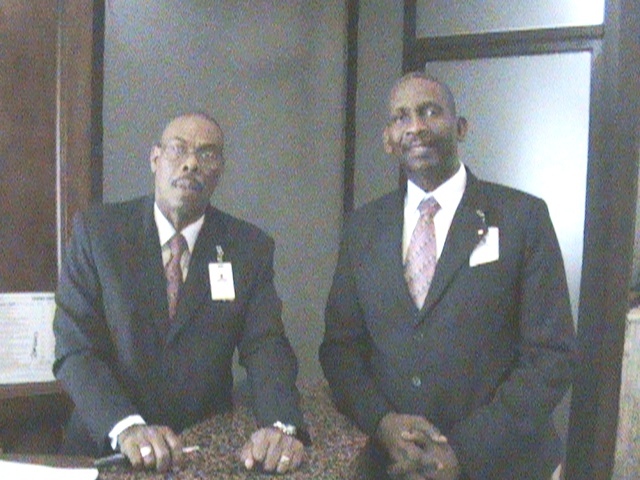 These gentlemen (see photo attached) Louis WARREN (at left) and Albert SMITH (at right) are Captains at the 5 star Riande Continental Hotel where we stayed, and in conversing with them I noticed that they pronounced certain words in English with a distinct Barbadian accent. I asked them if they were born in Barbados, they said their fathers were but they do not know if they still have any relatives in Barbados, being a firm believer in fate I assured them they most certainly were many members of the Warren and Smith families in Barbados – and I am pretty sure they would be as excited as I am to discover their long lost relatives (it has been a hobby & part time business of mine for over 20 years); and I promised these two fine gentlemen that I would send an article to the media in Barbados along with their photograph to get begin what I hope will end in long lost relatives reuniting once more. Thanks you for assisting us by publishing this article and accompanying photo. Anyone suspecting either of these two gentlemen to be their relatives may feel free to e-mail me for contact information at the Riande Continental Hotel in Panama.